Liverpool Plains grower Jamie Crossing planted PAC 607IT corn last summer at Colly Blue, Spring Ridge to supply feed mills and dairies around the region, but a heat wave and subsequent flood was not part of the plan. According to Mr Crossing, although meeting the specifications required by the feed corn market is not as rigorous as catering to grit corn specs, a tough season can still put him on the back foot. He explained that there was next to no rain from their early-October planting until Christmas, with the region receiving less than 30mm. An intense heat wave throughout the summer made matters worse. The area subsequently received 35mm between Christmas and New Year, followed by a flood when the rainfall touched 200mm. His corn crop however, survived all the highs and lows of the weather. He had planted 120 hectares of corn, 95% of which was irrigation and 5% dryland. He describes the feed corn as very robust since it could handle the extreme conditions. 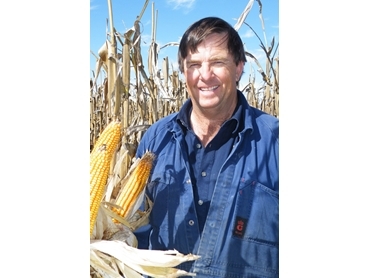 Mr Crossing said the corn was harvested mid-April to return an irrigated yield of 11.5t/ha and 5t/ha dryland. The grain quality was also excellent and there was no evidence of dead grain like other hybrids grown in the area. Mr Crossing said the feed corn was then stored on farm before heading out to processing at feed mills or to dairies as animal feed. He said a combination of fertilisers including anhydrous ammonia for the nitrogen component, and triphos helped him get the best out of the hybrid corn. The corn was planted with an Excel precision planter with John Deere boxes, configured at 12 rows with 75cm spacing at a seeding rate of 70,000 seeds/ha. At-plant, a batch of Dual Gold at 1.5L/ha was applied and his in-crop spray was a mixture of Starane and Atrazine. It was also the first season he had used a miticide to control pests. Mr Crossing said he was impressed with his PAC 607IT crop and will consider it again this summer.